The first Ugandan shilling (UGS) replaced the East African shilling in 1966 at par. Following high inflation, a new shilling (UGX) was introduced in 1987 worth 100 old shillings. 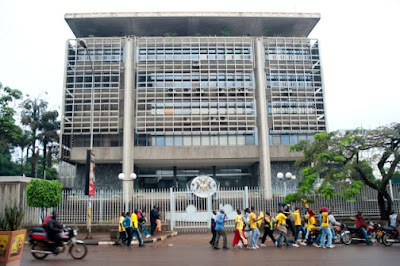 The shilling is usually a stable currency and predominates in most financial transactions in Uganda, which has a very efficient foreign exchange market with low spreads. The United States dollar is also widely accepted. The pound sterling and increasingly the euro are also used. Nyero Rock Paintings in Nyero Rock Caves. Coat of Arms depicting spears, waves of Lake Victoria, the Sun, a traditional drum, Crested Crane (Balearica regulorum gibbericeps), the Ugandan Kob (Kobus kob thomasi), River Nile, fertile land, coffee and cotton. Coat of Arms of the Bank of Uganda. Equator. Outline map of Uganda. Antelopes Kudu. Woman hoisting a baby in the air – National Independence Monument overlooking Speke Road and Nile Avenue in Kampala. Crested crane's head; Electrotype 1000; Cornerstones. Emmanuel Tumusiime Mutebile (Governor); George W. Nyeko (Secretary).